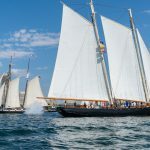 Festival of Sail is an annual event with something for everyone. Fun for the Entire Family. 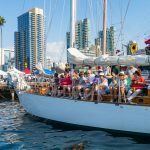 Festival of Sail is the LARGEST Tall Ship festival on the West Coast and is hosted at the Maritime Museum of San Diego, transforming the North Embarcadero over Labor Day weekend into a nautical theme park. 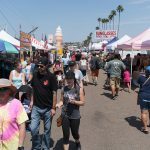 FREE Street Fair area is open to all. See more on our Facebook page, Click Here. Ticket sales are over for 2017. What is included with my Festival of Sail admission ticket? 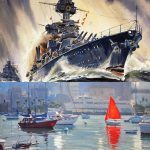 Visit all of the Maritime Museum of San Diego ships, plus the visiting ships, PLUS being able to board San Salvador! See exciting demonstrations, kids zone activities, beer gardens and a world of maritime fun! All for one low price. Includes one Passport per ticket, Additional Passports can be purchased at the Museum gift shop. Looking for added adventure? 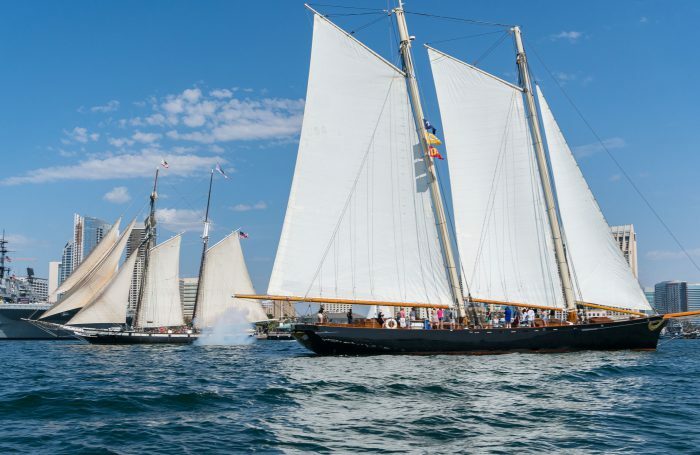 Enjoy one of these special Festival of Sail On-The-Water Adventures! On-The-Water Adventure Tickets INCLUDES Festival of Sail ADMISSION for the day of your adventure. Note: Online sales end early to allow walk-up ticket sales. Walk-up tickets available till sold out. 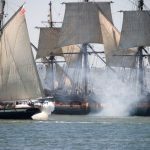 Join the Tall Ship crews and revel in the experience of tall ship sailing while we engage opposing ships in a mock Cannon battle on the bay. Two ships leave but only one comes back victorious. Have a little adventure 1800’s style! 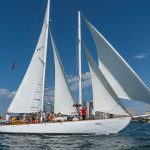 Enjoy the opportunity to take a special Festival of Sail 2 hour Mid-day Sail aboard a classic sailboat. Check-in is 1:30pm for a 2 hour sail. A portion of the afternoon Tall Ship cannon battles is viewable by the Mid-Day Sail. Sailing during some of the best wind of the day, the Mid-day sails always generate a fair amount of oohs and ahhs. Enjoy being on a truly classic yacht, speedsters of a time gone by. 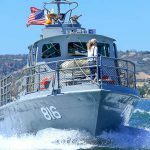 A special Festival of Sail 30 minute high-speed cruise that highlights San Diego Bays Military History aboard PCF 816 Patrol Craft Fast – Swift Boat. PCF 816 & PCF 813 are the two PCF training vessels used along the Pacific Coast. In 1971, the U.S. Navy donated these two Swift Boats for the Republic of Malta’s newly formed Maritime Squadron. 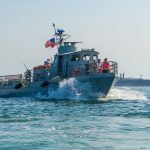 After four decades of coast guard duty in the Republic of Malta, Swift Boat P24 (originally U.S. Navy PCF 816) was returned in 2012. The Swift Boat Sailors Association brought this Swift Boat to the Maritime Museum of San Diego to be restored and operated on San Diego Bay. Museum visitors now have the opportunity to experience the sound and feel from the two V12 Supercharged Detroit diesels delivering 980 horsepower while touring on the bay. 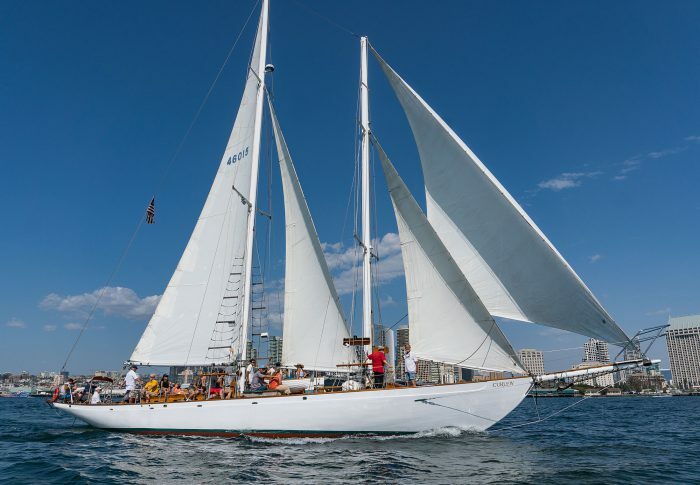 Take a special Festival of Sail 2 hour Twilight Cruise aboard a classic sailboat. Check-in is 4:30pm for a 2 hour sail. 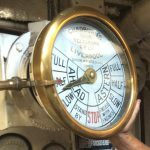 No Twilight Cruise on Monday. Friday Twilight Cruise is aboard the famous yacht America, plus Saturday & Sunday. Started in 2010, Twilight Cruise proved so popular we have brought them back for each Festival of Sail, and why not? These are the moments that make memories, the perfect way to end a perfect day on the water. Take a special Festival of Sail 30-minute Historic Bay Cruise aboard Pilot, our 1914 pilot boat. Pilot is the oldest active pilot boat in the country. She is a San Diego original, built in 1914 close to her present location and having spent her entire career working on San Diego Bay, but she is far from retired! Bay cruises, floating classroom, private events, and still used by bay pilots for special occasions, Pilot could very well be the most active boat ever made! Ships you will be able to visit with your Festival of Sail ticket. *Part of the Maritime Museum of San Diego’s fleet. The San Salvador under the command of Juan Rodriguez Cabrillo, arrived at the port we now call San Diego on September 28, 1542, before proceeding further north in search of new trade routes. She was the first recorded European vessel to sail along California, and survey its coastline. Her expeditionaries established a generally friendly first contact with the indigenous peoples of that coast. 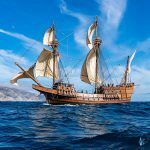 The San Salvador must be considered the founding ship of San Diego and of the State of California. As such she functions as an “origin symbol” ship for San Diego in much the same way as the Mayflower is the origin symbol ship of New England. Her story represents the beginning of a common heritage for the peoples of California, both past and present. 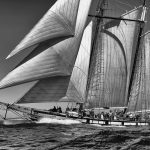 America is a replica of the schooner that won the first Royal Yacht Squadron’s race around the Isle of Wight for a cup of one hundred sovereigns in August of 1851. Henceforth, the cup was named the America’s Cup (named after the yacht). George Steers was the original designer of America in 1850, but in 1995, an America’s Cup enthusiast had America re-built in New York. 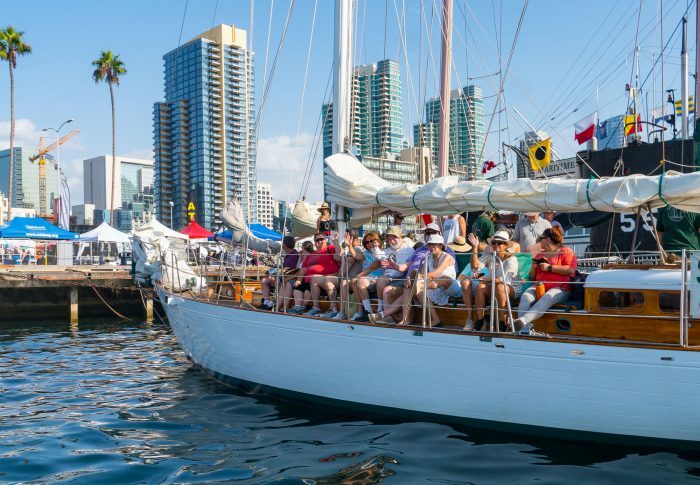 She was later sold to Next Level Sailing for weekly public sailings and private charters from her dock at the Maritime Museum of San Diego. One of a fleet of diesel electric submarines the Soviet Navy called “Project 641,” B-39 was commissioned in the early 1970s and served on active duty for more than 20 years. 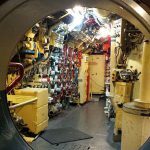 300 feet in length and displacing more than 2000 tons, B-39 is among the largest conventionally powered submarines ever built. The Soviet and then Russian Federation navies deployed these submarines from the mid 1950s through the early 1990s. They played a part in many of the Cold Wars most tense moments including the Cuban Missile Crisis. Built: by Southern Pacific R.R. Built by Union Iron Works in San Francisco Oct 18 1898, Berkeley is a double-ended, steel-hulled, steam ferryboat with a triple-expansion engine. The first successful propeller-driven ferry boat on the west coast, thereby ending the era of paddle and side wheel propulsion, Berkeley played a crucial role in California history, ferrying railroad and commuter passengers between San Francisco and Oakland/Alameda for 60 years. Perhaps her most historic day was April 18, 1906, when she shuttled thousands of refugees from the burning earthquake-devastated city and returned with necessary supplies. Bill of Rights is a wooden, gaff-rigged topsail schooner designed by McCurdy, Rhodes & Bates. She sailed the waters of New England from 1971-1997. In 1998 the Los Angeles Maritime Institute brought her west. 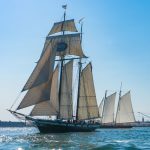 Later, American Tall Ships Institute began offering immersion-type sailing programs and public day sails. 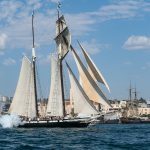 In 2013 she was acquired by the South Bayfront Sailing Association and currently offers life-changing adventures utilizing on-the-water art, science and maritime instruction. The Californian joined the historic fleet of ships at the Maritime Museum of San Diego in 2002. 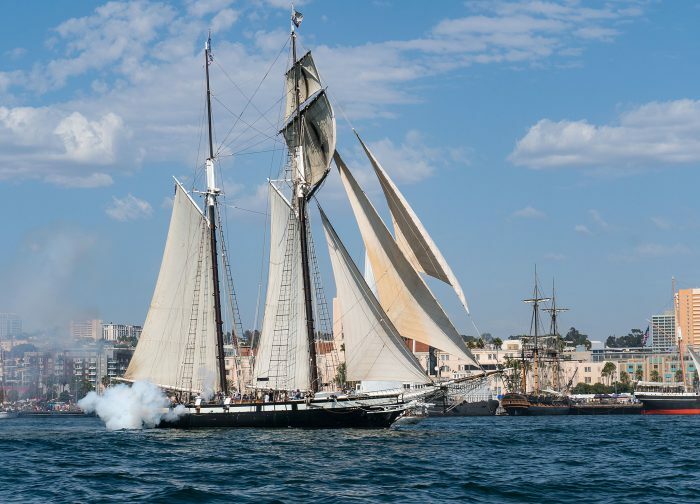 She is the Official Tall Ship of the State of California and helps carry out the educational missions of the Maritime Museum by hosting thousands of students year round in a variety of American history, sail training and Youth-At-Risk programs. 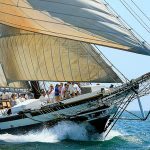 The general public can sail her on weekends, special event sailsand adventure sail expeditions to Catalina Island. She was designed as a replica of the 1847 revenue cutter C.W. Lawrence. Built long and lean, revenue cutters patrolled the California coast during the Gold Rush era and were a precursor of today’s Coast Guard. 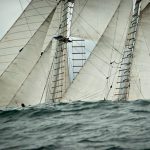 The Cloudia is a rare example of a classic Norwegian double ended ketch. Cloudia is a Listerskøyte inspired by the original designs of famed naval architect Colin Archer. The top-sail ketch is notable for durability and safety. Archer’s shipyard designed and constructed the famed Fram which participated in a number of expeditions to the North Pole and later supported Roald Amundsen’s historic first expedition to the South Pole. Although Archer’s designs were all initially intended as rescue boats, they became popular for commercial use and in the pleasure sailing market during the 20th Century, and remain so to this day. Only a very few of Archer’s original boats remain. The Cloudia is a beautifully restored example of this type. Current research suggests that the Cloudia was built in 1934 as a Listerskøyte, a classic Norwegian design from the second half of the 19th century under the name M/S Prøv. Originally a wind powered only vessel, the Cloudia had her first single cylinder Rapp engine installed at the Wickmann Motor Fabrick in 1955. It is unclear how Cloudia spent her early years. She may have moved to Germany after the war. Records indicate that she was first registered in the United States Virgin Islands in the summer of 1974. In 1976 registration was moved to Los Angeles. She was the star of a Warner Brothers movie, the Sea Gypsies released in 1978. In February 2009, the Cloudia was salvaged from San Diego America‘s Cup Harbor. She was sitting on the bottom stuck in the mud. There were several holes in the hull with 2 large gaps at the water line where planks had rotted because of fresh water damage. 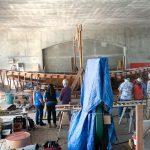 After a two-week test to check her integrity, the Cloudia was towed to the Driscoll Mission Bay boatyard where her restoration to exacting US Coast Guard standards was achieved. 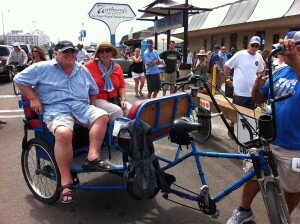 She is now available for Eco-tours and Whale watching from San Diego. Like many tall ships her age, Curlew has many sea stories to tell. Originally built for Charles Andrews of the New York Yacht Club, Curlew competed in the N.Y.Y.C.’s ocean cruising class racing from Newport to Bermuda. She was then donated to the Merchant Marine Academy in 1940 to serve as a sail training vessel and conducted submarine patrol duty for the Coast Guard during WWII. She continued to serve as a training vessel for the Coast Guard in New Haven, Connecticut and Cape May, New Jersey. Her career in the charter service started with her delivery crew having to abandon her in a storm that was reported to be the largest low pressure in the area for 40 years, which took the lives of 144 people in 1962. After many owners and extensive rebuilds she cruised in the Central and South Pacific, and the West Coast. Today, Curlew’s owner and captain, Bob Harrison operates a successful sailing charter out of Dana Point. The Dolphin was a phenomenally versatile research vessel. Never a Warship, but used to develop Submarine technology now in use in the US Fleet. Dolphin originally had one torpedo tube and conducted deep submergence torpedo firing exercises. The Torpedo tube was removed and replaced with a sonar dome adding 13 feet to the ships length. Dolphin also served as a test platform for unmanned under water vehicles, swimmer delivery systems, and littoral warfare systems. Electronic and Electromagnetic Systems were tested for; laser communications, imaging systems for under water search operations, advanced antenna systems and high resolution radar. 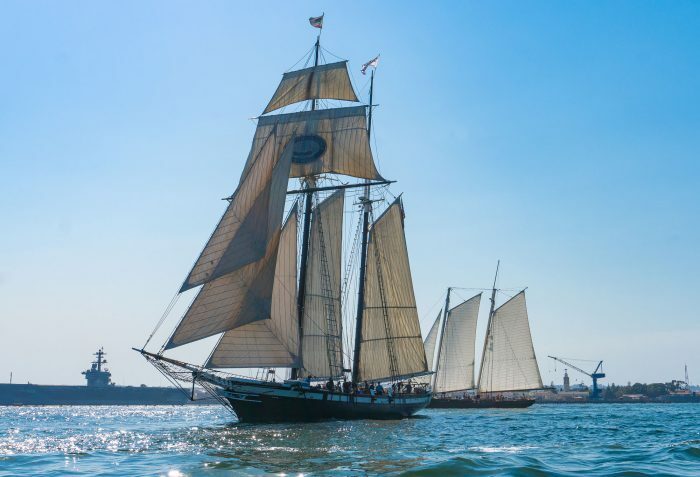 A pair of twin brigantines, The Exy and Irving Johnson are state-of-the-art sail training vessels designed to meet the needs of the Los Angeles Maritime Institutes (LAMI’s) TopSail Youth Program. 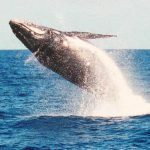 Their primary mission is introducing youths to the subtle but profound influence presented by the sea. These twin brigantines were named after sail training pioneers, Irving and Electra “Exy” Johnson. 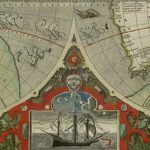 The Johnsons circumnavigated the globe seven times in all. They did this on two different boats, both named Yankee, with each trip using a new group of boys and girls who possessed only a sense of adventure and curiosity. 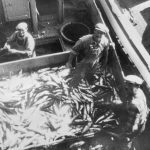 For twenty-five years, beginning in the 1930’s, the Johnsons lived a life at sea that is now legendary and whose legacy continues to give back through the Irving Johnson and LAMI. 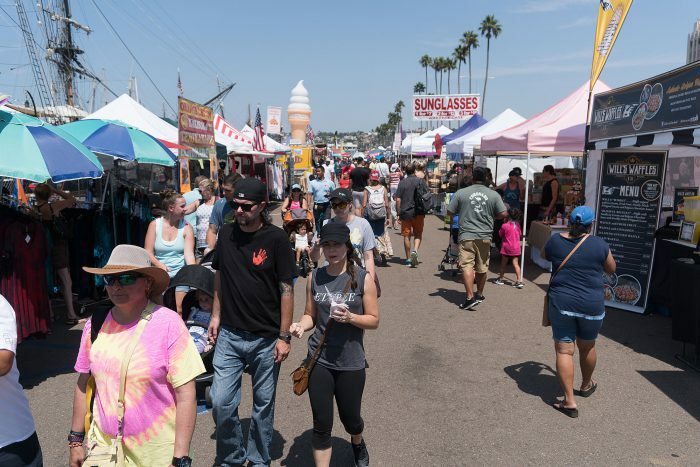 The Harbor Police Department patrols and protects the tidelands and San Diego Bay, which includes five member cities from San Diego, Coronado, Chula Vista, National City and Imperial Beach. The Port of San Diego is also a strategic port – meaning the port must coordinate and work with the military when needed. 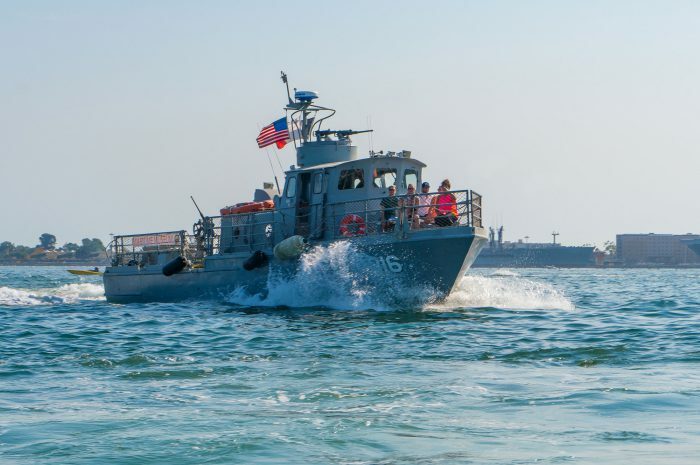 The Harbor Police work in partnership with the U.S. Coast Guard, the U.S. Navy, federal Homeland Security officials and Customs and Border Patrol. The Harbor Police Department is a unique law enforcement agency in that all of its officers are trained firefighters. HMS Surprise began her career as part of our nations bicentennial celebration. Her builders painstakingly reproduced the 24-gun frigate, the HMS Rose, from the original British Navy plans. 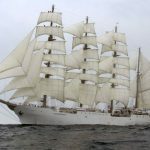 In 1991 she was certified as Americas first Class-A sail training vessel. In 2001, 20th Century Fox bought her, modified her, changed her name to HMS Surprise for the hit movie Master and Commander. Since that time she has appeared in many Hollywood movies and commercials, including the 2014 Superbowl commercial for TurboTax. She joined the Maritime Museum of San Diego’s historic fleet upon her purchase from Fox Studios in 2004. Jada, originally build as a schooner, was converted to a yawl in the 1950’s to meet new racing rules more favorably. She has raced the Transpac to Hawaii five times and won the Tahiti race in 1969. Her classic Philip Rhodes design with traditional lines and beautiful teak interior illustrate the fine craftsmanship of world class yacht building. 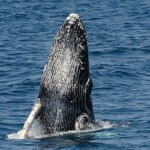 Jada’s classic beauty can often be seen out on San Diego Bay or out to sea on charters and whale watching sails. Schooner Patricia Belle was built by owner Captain Patrick Hughes from 1994 – 1998. She was constructed of locally grown Douglas Fir in Port Orchard, Washington. Her inaugural cruise was from Seattle to Nicaragua, returning with 10,000 pounds of Arabic coffee to San Diego. Patricia Belle has sailed the Pacific to Hawaii, Mexican Waters annually for 10 years to, Central America, Panama, through the Gulf Coast of America, Bahamas, Caribbean and South America. As a private family-owned schooner, friends, family and mariners in training are always welcome aboard. 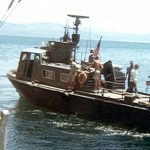 The Patrol Craft Fast (PCF), or “Swift Boat” as it was known began service in 1965. Adapted from offshore oil service vessels, they were used to patrol the coastline and inland waterways of Vietnam from 1968-1975. PCF training was based at Naval Amphibious Base Coronado on San Diego bay. In 1971, PCF-816 she was donated by the US Navy to the Republic of Malta and renamed P24. She was used for coast guard duty, interdicting smugglers, harbor security, and search & rescue. After forty years of coastguard duty, Malta retired these boats from service. In 2011, Malta’s Minister of Defense donated a Swift Boat to the Maritime Museum of San Diego with our promise to preserve her history and to pay tribute to all Swift Boat Sailors from both countries. Launched August 7th 1914, Pilot was built by Manuel Gourlarte in his boat yard on San Diego’s waterfront. Pilot served as San Diego Bays official accompanying pilot boat for commercial ships entering and leaving the harbor for 82 years. It has been said that Pilot had the longest working life of any vessel in the western hemisphere. In addition to public day cruises, Pilot now hosts school groups on “Economy and Ecology” voyages, where students help with navigation and perform water quality experiments while exploring the Bay. 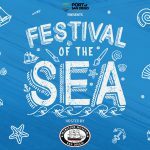 Spirit of Dana Point is a fine example of an eighteenth century vessel giving today’s children the chance to learn about life at sea. Originally named Pilgrim of Newport, she was the dream and work of Dennis Holland. The recreation of this replica of a 1770’s privateer used during the American Revolution was eventually purchased by the Ocean Institute in 2004. 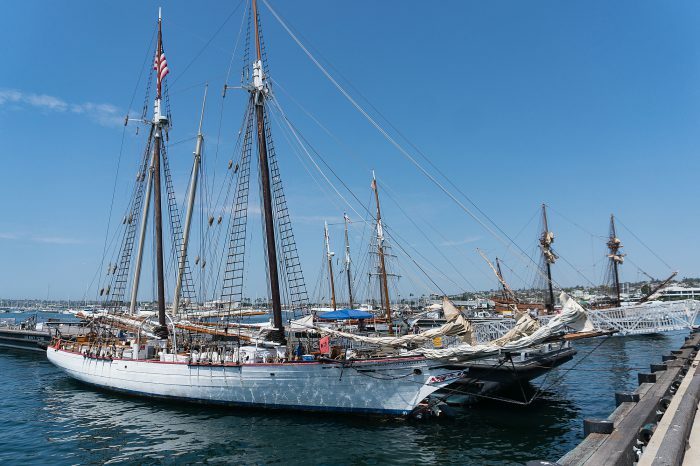 She joined her education fleet and was renamed the Spirit of Dana Point in honor of the community that supports her worthy mission. The emblematic flagship of the Maritime Museum of San Diego, Star of India holds the distinctive title of the oldest active sailing ship in the world. Star of India became a National Historic Landmark in 1966, and was awarded the World Ship Trust and American Ship Trust Maritime Heritage Awards in 1996. She began her life as the British full-rigged ship Euterpe, named for the ancient Greek muse of music. She is one of the earliest iron hulled ships to be built in the world. 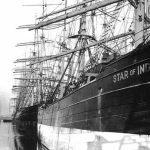 In 1901, the Alaska Packers of San Francisco rigged her down to a barque, and renamed her Star of India. In 1927, she was purchased and brought to San Diego. 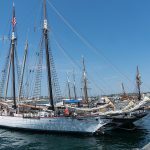 After extensive restoration the Star of India sailed for the first time in over 50 years for the 1976 Centennial Celebration of America. Dedicated staff & volunteer crews continuity maintain and sail her for future generations to enjoy. Ship availability subject to change. We want YOU for Festival of Sail 2017! • Click Here to download 2017 application. Spots sold out for food, hats, and sandals. 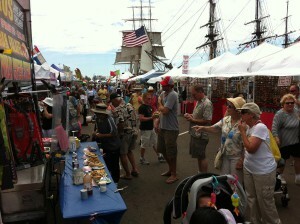 Be a part of the premier Tall Ship Festival along the West Coast. Meet new people, see amazing ships, enjoy some lasting memories, apply now! 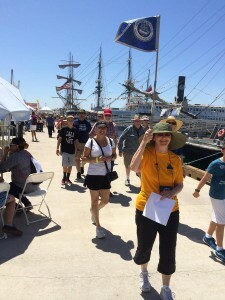 Volunteers and staff of the Maritime Museum of San Diego. An incredible venue right on the Embarcadero. With beer gardens, kids activity zone, and a low admission per person, this is the premier waterfront event year after year. 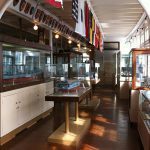 Entry is free for Maritime Museum members with ID & membership card. Vendor area is free to all.